This handbook is an important and valuable source for engineers and researchers in the area of internal combustion engines pollution control. 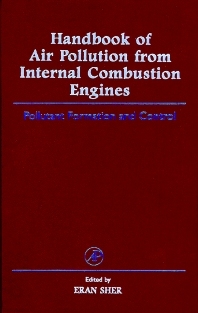 It provides an excellent updated review of available knowledge in this field and furnishes essential and useful information on air pollution constituents, mechanisms of formation, control technologies, effects of engine design, effects of operation conditions, and effects of fuel formulation and additives. The text is rich in explanatory diagrams, figures and tables, and includes a considerable number of references. Overview: J.B. Heywood, Motor Vehicle Emissions Control: Past Achievements, Future Prospects. Global Aspects: E. Sher, Environmental Aspects of Air Pollution. R. Carel, Health Aspects of Air Pollution. P.O. Plaut and S.E. Plaut, Economic and Planning Aspects of Transportation Emission. Spark-Ignition Engines: R. Stone, Introductory Chapter: Overview and the Role of Engines with Optical Access. S. Hochgreb, Combustion RelatedEmissions in Engines. M. Dulger, Pollution from Rotary Internal Combustion Engines. B.E. Milton, Control Technologies in Spark Ignition Engines. Compression-Ignition Engines: F. Pischinger, Introductory Chapter: The Diesel Enginefor Cars--Is There a Future? J.G. Hawley, C.J. Brace, F.J.Wallace, and R.W Horrocks, Combustion Related Emissions in Engines. S.J. Charlton, Control Technologies in Compression Ignition Engines. Two-Stroke Engines: C.C. Stan, Introductory Chapter: From a Simple Engine to an Electronically-Controlled Gasdynamic System. Y. Ikeda, T. Nakjima, and E. Sher, Air-Pollution from Small Two-Stroke Engines and Technologies to Control It. S. Henningsen, Air-Pollution from Large Two-Stroke Diesel Engines and Technologies to Control It. Fuels: D.R. Blackmore, Introductory Chapter: Fuel Effects. Y. Zvirin, M. Gutman, and L. Tartakovsky, Fuel Effects on Emissions. References. Appendices: National Gasoline Specifications. National Specifications for Automotive Diesel Fuel. US EPA Models for Calculation of Fuel Effects on Exhaust Emissions. Professor Eran Sher was awarded the John Orr Award in 1989 for leading research in mechanical engineering, and the Bergman Award in 1995 for outstanding scientific achievements. He received his B.Sc. degree in Mechanical Engineering from the Ben-Gurion University of the Negev and his Ph.D. at the University of Manchester Institute of Science and Technology. Sher joined the Department of Mechanical Engineering of the Ben-Gurion University of the Negev in 1978. Shortly thereafter, he established the internal combustion engines teaching and research laboratory of the department, which was recognized as a center of excellence in 1995 for its research and development studies.Professor Sher is co-author of a fundamental-oriented based text entitled The Two-Stroke Cycle Engine, Its Development, Design and Characteristics, and is the author of a student textbook entitled Introduction to Internal Combustion Engines(in Hebrew). Other published texts include over 120 scientific articles. He has presented more than 70 papers in international conferences.